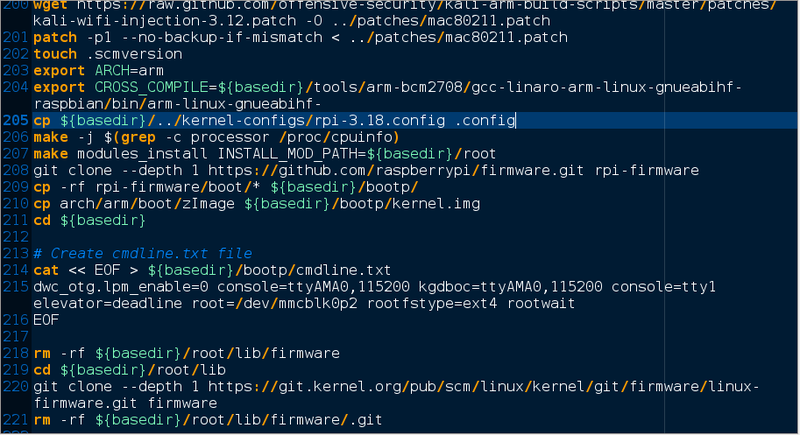 Save the file as “rpi-3.1.8.config” in the kernel config directory. Modify the rpi.sh script to use our new kernel configuration. Now run the rpi.sh command, if all goes well, you should see something like below. You will probably encounter a problem with ‘startx’ command freezing the ‘X’ environment with the build. If this is the case, then look at the kali linux forum post here. The solution is essentially to copy the /lib/modules directory from the Raspbian image. I will look at modifying the build script to solve this in the near future. This entry was posted in Kali Linux, Raspberry Pi 2, tutorial. Bookmark the permalink. could you please provide some information on were the kernel config file came from and what was changed? I simply ran a zcat /proc/config.gz on a running Raspbian image to dump the kernel configuration. I did not change any of the kernel options. I would do an ls -lah on file you produced. Mine as around 3.1GB in size if memory serves. If it is larger than that, then it probably a build problem of some sort. Also, i used dd to flash my file to sd card, it is important with dd to make sure you have the device names correct, mine was mmcblk0 (whole sd card) and not mmcblkop1 or mmcblk0p2 which refers to the SD card partitions. If you think it is a build problem, then set your terminal for infinite scrolling in the preferences, run your build and save the output to a text file and put it up somewhere it can be downloaded and I will check it against mine. 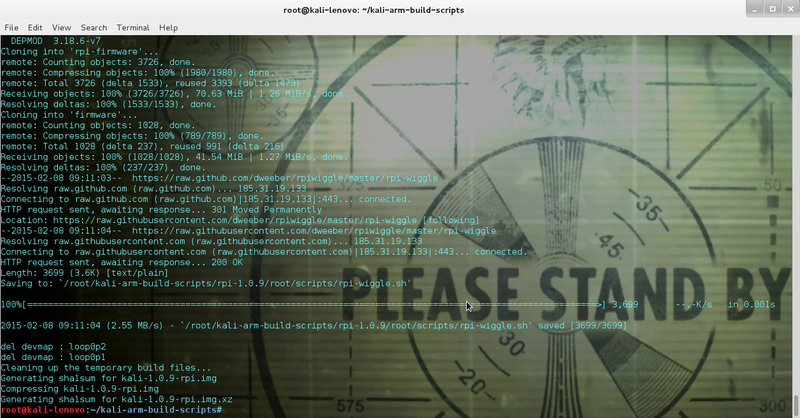 I am building on a Kali Linux machine not Ubuntu. You mount the root partition raspbian image at say /mnt/raspbian-boot this is normally /dev/mmcblk0p1. Next do the same for raspbian root partition at /mnt/raspbian. Mount kali image root and boot at /mnt/kali and /mnt/kali-boot as read write. Now you can delete the contents of /mnt/kali/lib/modules and mnt/kali-boot. Unmount all partitions and you should be good. You don’t need to copy the modules from the old debian image. Hi YunnHui, build fails on kali due to glib < 2.14 during kernel compile did you build on Ubuntu or Debian? If not how did you upgrade kali without breaking it as there dependancy issues when I tried. I built it in 64bit Arch Linux, and a ubuntu vm.